David is a master mariner with seagoing experience on bulk carriers and tankers. Upon coming shore, he was employed for two years as a claims manager with a Piraeus based P&I correspondent and broker before joining a well-respected marine survey company in Greece. From 1997 to 2010 he managed his own marine consultancy with the majority of work being P&I related. The scope of instructions included marine casualties, oil pollution, cargo damage, personal injury incidents, condition surveys and expert witness. From 2010 he was employed as a senior claims executive with a Group P&I club handling a wide range of P&I and FD&D claims for their Greek membership. 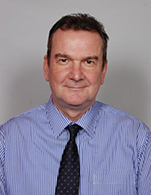 In 2014 he joined the loss prevention department of the UK P&I Club where his activities have included performing shipboard risk assessments, contributions to the Club's published output, assisting Members with operational enquiries and active participation in Members crew training seminars worldwide.